Seventeenth-century farmhouse completely restored with original materials with stone walls and wooden deck and tiles. Located 2 km away through the forest track of Villarroya de los Pinares (Historic Artistic Set) in the Region of Maestrazgo aragonés. Within 140 hectares with junipers, junipers, pines and poplars. With coast to the Guadalope river, affluent of the Ebro river. At the foot of the farmhouse there is a lagoon creating a particular environment. You can do hiking, canyoning, cycling, mountain biking, walks, mushroom and mushroom picking, visits to the town, birth of the Guadalope River, Aliaga geological park, Dinópolis (Teruel), Ruta de los Pilones. Walking around the farmhouse and in its vicinity are easily fossils of invertebrate animals of the Cretaceous era. 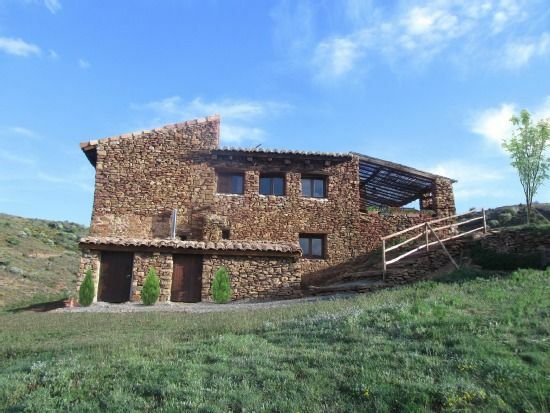 20 minutes from the ski slopes of Valdelinares and near tourist attractions such as the Ruta del Cid, the town of Albarracín or the city of Teruel. The house is developed on two floors with a total of 370 m2. It has a wide access; a living room with fireplace with TV (No Antenna, USB and HDMI connection) and dining room for 12 people; a study with a desk and library; a clean up; a bedroom with double bed with exclusive bathroom and a fully equipped kitchen with table for 6 people, ceramic hob, microwave, oven, dishwasher, fridge, toaster and all the necessary equipment. On the other floor, the master bedroom has a double bed, direct access to the solarium, dressing room and exclusive full bathroom with bathtub; two bedroom with two beds each; a bathroom and a bedroom with double bed and exclusive bathroom. In total there are 5 bedrooms and 5 bathrooms. The house has central heating with radiators in all rooms and towel radiators in the bathrooms; central hot water; tile floor tiles, ceramics in bathrooms; the walls are made of original stone and the roof beams and tiles have been preserved. White and full menage. It has a terrace as an extension of the kitchen; solarium; full barbecue; garden furniture; parking; lagoon at the foot of the house and roads around it since the farmhouse is within 140 hectares of its own. Seventeenth-century farmhouse completely restored with original materials with stone walls and wooden deck and tiles. Located 2 km away through the forest track of Villarroya de los Pinares (Historic Artistic Set) in the Region of Maestrazgo aragonés. Within 140 hectares with junipers, junipers, pines and poplars. With coast to the Guadalope river, affluent of the Ebro river. At the foot of the farmhouse there is a lagoon creating a particular environment. You can do hiking, canyoning, cycling, mountain biking, walks, mushroom and mushroom picking, visits to the town, birth of the Guadalope River, Aliaga geological park, Dinópolis (Teruel), Ruta de los Pilones. Walking around the farmhouse and in its vicinity are easily fossils of invertebrate animals of the Cretaceous era. 20 minutes from the ski slopes of Valdelinares and near tourist attractions such as the Ruta del Cid, the town of Albarracín or the city of Teruel. INSIDE The house is developed on two floors with a total of 370 m2. It has a wide access; a living room with fireplace with TV (No Antenna, USB and HDMI connection) and dining room for 12 people; a study with a desk and library; a clean up; a bedroom with double bed with exclusive bathroom and a fully equipped kitchen with table for 6 people, ceramic hob, microwave, oven, dishwasher, fridge, toaster and all the necessary equipment. On the other floor, the master bedroom has a double bed, direct access to the solarium, dressing room and exclusive full bathroom with bathtub; two bedroom with two beds each; a bathroom and a bedroom with double bed and exclusive bathroom. In total there are 5 bedrooms and 5 bathrooms. The house has central heating with radiators in all rooms and towel radiators in the bathrooms; central hot water; tile floor tiles, ceramics in bathrooms; the walls are made of original stone and the roof beams and tiles have been preserved. White and full menage. EXTERIOR It has a terrace as an extension of the kitchen; solarium; full barbecue; garden furniture; parking; lagoon at the foot of the house and roads around it since the farmhouse is within 140 hectares of its own. Nos alojamos en esta preciosa casa un grupo de 9 amigas para pasar la Nochevieja y no pudimos estar mejor. La casa tiene todas las acomodaciones precisas, buenos colchones, buena calefacción, una cocina muy agradable y unos espacios comunes muy amplios. Si algo tenemos que señalar es el camino pedregoso para llegar a la casa, ya que se encuentra distanciada del pueblo y el camino no es muy agradable, tuvimos algo de mala suerte e incluso pinchamos una rueda en medio del camino, menos mal que la anfitriona acudió a nuestro rescate y en el mismo día 1 de enero. Los anfitriones genial, siempre dispuestos a solicitar lo que precisáramos. Sin duda, volveremos, pero con coches más equipados. Respecto al interior es una casa acogedora con suficiente espacio para alojarse un grupo grande, las habitaciones y sus respectivos baños estaban muy limpios. Respecto a las zonas comunes son amplias y acogedoras. La cocina esta muy bien equipada y es amplia. Después de pasar unos días no la recomendaría a nadie. No funcionaba el lavavajillas ni la luz, la vajilla estaba muy sucia, había telarañas por todas partes, colchas manchadas... parecía que no hubieran limpiado en años. Los cristales de dos ventanas estaban rotos, con el peligro que supone si vas con niños. Teníamos incluso ratas que nos visitaban por las noches. Es una lástima porque es una casa con muchas posibilidades, pero estaba todo muy descuidado y sucio. Muy buena opción para descansar, estuve con un grupo de amigos y a pesar de ser muchos teníamos espacio y comodidades suficientes para no molestarnos. Altamente recomendable. El lugar precioso y el trato con el dueño fue muy sencillo y agradable. Hemos estado con amigos y niños. Está muy bien para descansar y aislarse del mundo. Las estrellas se veían como nunca las habíamos visto antes. Para dormir bien, excelente. La casa es grande y bonita, aunque un poco alejada para ir a menudo al pueblo, donde por cierto nunca abrían pronto la panadería, por lo que se recomienda llevar desayunos. La piscina del pueblo genial, con agua helada a pesar del bochorno de agosto. Experiencia recomendable, pero un poco lejos de Teruel, para quien vaya a Dinópolis.